I encourage you to purchase the best meter package that you can afford as higher priced meters will typically give you more accurate readings. 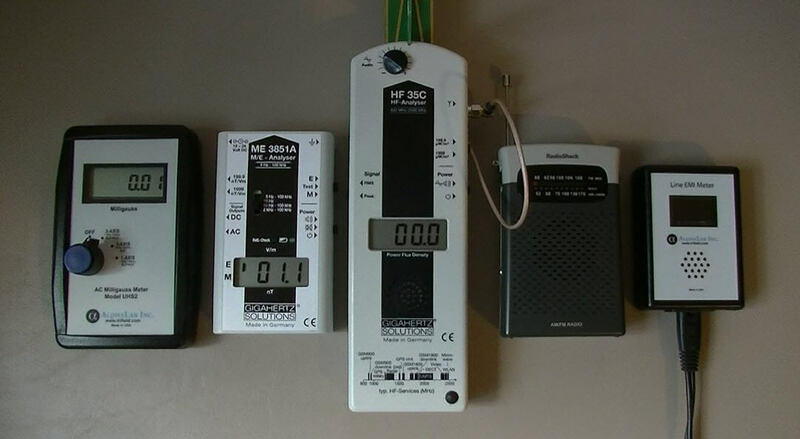 Special Note: I have recently updated my recommendations for EMF meter packages. You can see my current recommendations on this page. If you make a purchase with SLT, please read this page first. 1.) For Radio Frequency/Microwaves, I recommend the Gigahertz Solutions HF35C for $312. 2.) For Magnetic Fields, I recommend the 3-axis Alpha Labs UHS2 for $279. 3.) 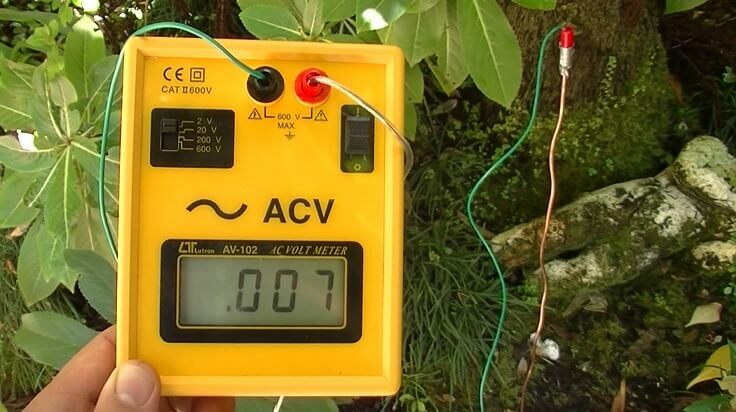 For Electric Fields via body voltage, I recommend the Body Voltage Meter with grounding chord for $109. You can buy a 2 foot copper grounding wire for $1 at your local hardware store for your ground. This BV kit will work as well for $120. 4.) 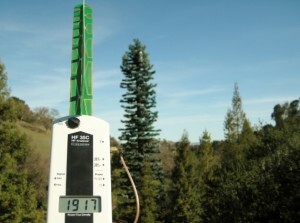 For Dirty Electricity, I recommend the Alpha Labs Line Noise EMI Meter for $117. 5.) For high frequency electric field (EMI) detection, I recommend that you have Radio Shack model 12-467 AM radio (typically found for $20 on ebay). You can read why here. Note that other models do not detect EMI. 2.) For Magnetic and Electric Fields, I recommend the combo Gigahertz Solutions ME3851A for $360. 3.) For Dirty Electricity, I recommend the Alpha Labs Line Noise EMI Meter for $117. 4.) For high frequency electric field (EMI) detection, I recommend that you have Radio Shack model 12-467 AM radio (typically found for $20 on ebay). You can read why here. Note that other models do not detect EMI. The total cost of this advanced meter package is approximately $765. If you have the funds, you may want to upgrade the RF meter to the Gigahertz Solutions HF59B. You can read how here. The above meter package is what I use. The readings are also ideal with extremely low fields. Low-freqency Magnetic at 0.01 mG; Electric at 1.0 V/m; RF at 0.0 uW/m2 (-60 dB); very low noise with AM radio and EMI readings below 100 mV (when plugged in). 1.) 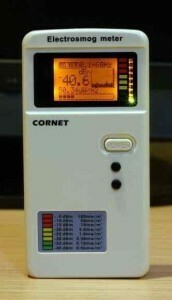 For RF, Magnetic and Electric fields combined in one meter, I recommend the Cornet ED88TPlus for $179. 2.) 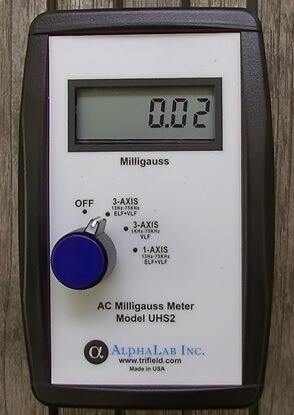 For Dirty Electricity, I recommend the Alpha Labs Line Noise EMI Meter for $117. 3.) For high frequency electric field (EMI) detection, I recommend that you have Radio Shack model 12-467 AM radio (typically found for $20 on ebay). You can read why here. Note that other models do not detect EMI. The total cost of this package is approximately $300. This a great way to start out for a decent price. Note: If your funds are limited, you could get the Cornet ED88TPlus meter along with the Radio Shack model 12-467 AM radio for EMI detection and have a very basic meter kit for $180. However, this kit is not sensitive enough for most electrically sensitive people.